Online Presence Builders partnered with a local, marketing agency Pabst Creative to build a full ECommerce website solution. 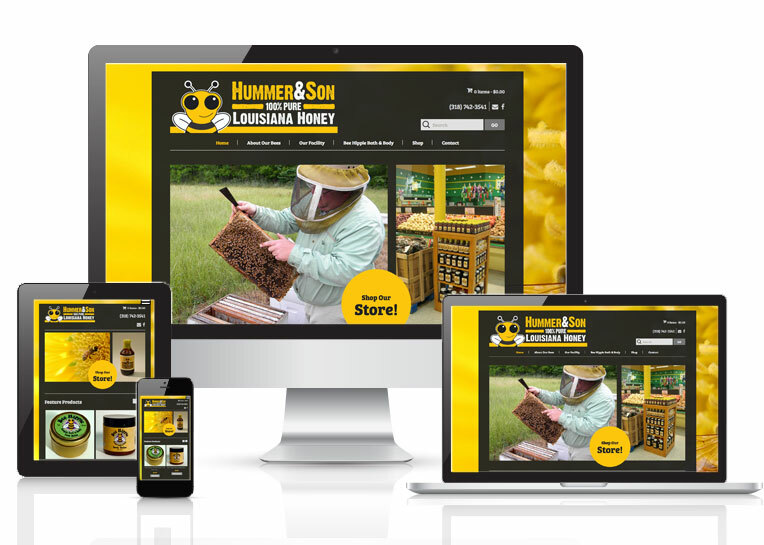 With a user-friendly, clean design, Hummer & Sons Honey can easily manage and sell the products offered on their website. The design is visually appealing, having content that search engines may easily navigate and rank. Using Woocommerce shopping cart software Online Presence Builders created significant pathways to successfully attain more business for Hummer & Sons Honey through their website. Hummer and Sons Honey Bee Company is a local honey company, located in Bossier City. Hummer & Sons produces 100% single-source Louisiana honey to our regional customers. Louisiana bee colonies produce an average of 115 pounds of honey each. Hummer and Son currently maintains approximately 500 colonies in Caddo, Bossier and Red River parishes, and plans to expand during the upcoming season, adding an additional 250 colonies. You can find Hummer and Sons honey in many local and nation-wide grocery and retail stores. Or visit our website to buy online and have our honey delivered straight to your door.